Noel Cruz is, in my opinion, an ace-artist when it comes to portraits. I came across his repaints when google-ing up doll repaints and found his beautiful, beautiful portraits on Ashton Drake's Gene. Of course, it was his interpretation of Scarlett that captured my attention. his talent - Tonner's Scarlett in the Twelve Oaks day dress. I was amazed at how he was able to patiently lay on detail after detail on the doll, how his repaint captured light and shadow creating the most realistic and life-like feature possible. Unparalleled and unsurpassed, his repaints remain to be my standard when it comes to doll repainting. See more of his repaints in www.ncruz.com. 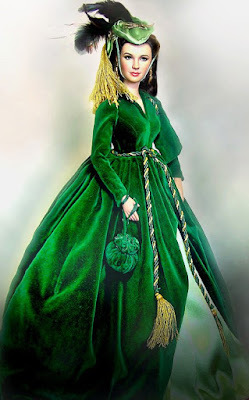 After doing his second Tonner Scarlett (Kissing Ashley Goodbye), he was very kind to have sent me an email with a picture of this doll dressed in Franklin Mint's "curtain dress"; a photograph he never posted in ebay nor in his site. I share this now with you all, my little Noel Cruz token of his talent and friendship. You certainly couldn't have a better muse. Noel is quite amazing. His Scarlett/Gene in the shame gown was the firt repaint to capture my heart, and then his Vivien Leigh~ now your work continues to do so as well. Noel's Scarlett shown here in the drapery dress is no exception to his incredible talent. She looks so life-like. Yes, Thanks for sharing this rare picture... As Nikki, that was his Gene/Shamed Scarlett that seduced me first, because he succeeded in recreating the elaborate hairstyle, and the particular "I despise you all" expression on Scarlett's face ;-)). But his "kissing Ashley goodbye" is amazing too. It's a shame he doesn't publish any book or website with tutorials. he is the best !